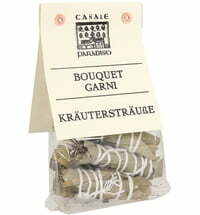 Bouquet Garni, or also called bouquet garni, consists of laurel, parsley and thyme. These three herbs are traditionally tied together with kitchen string or stuffed in a cotton bag. Bouquet Garni tastes much like the flavor of bouillon, and adds something special to soups, sauces, stews and casseroles.